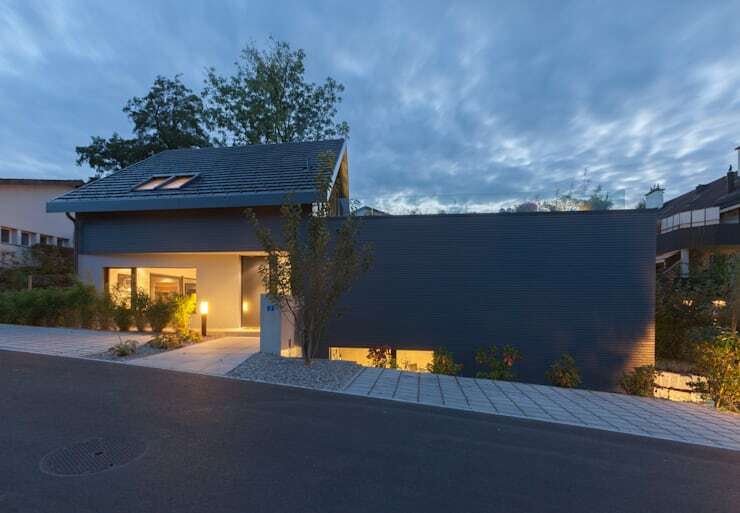 Join us today on homify 360° as we touch down in Hafnerbach, Austria, where a wickedly beautiful house awaits us (just what else did you expect to find here on homify?). 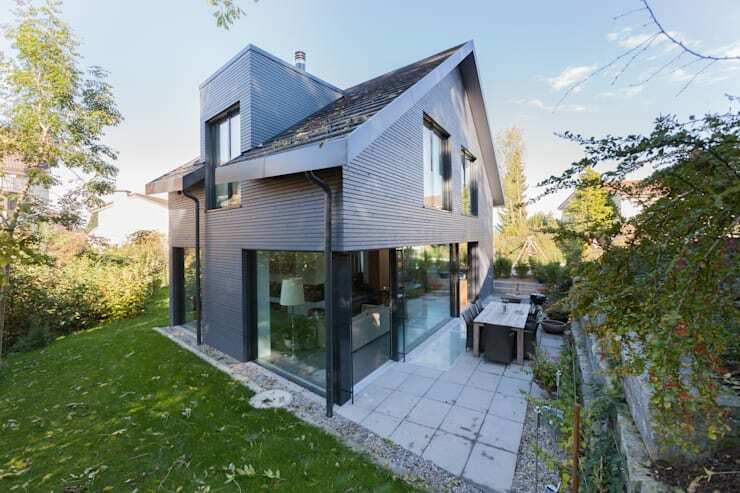 Courtesy of Swiss architectural firm Von Mann, this single-family house flaunts a neat façade that is handsome enough, yet hides a wealth of artistic beauty behind it. Spacious areas, a mix and match of materials, unique colour combinations – this house seems to have it all, decked out in modern splendour! We purposely start our tour with a night-time shot of the façade, for then this house hides in the shadows and become just another regular residence located on a sloping street in the quiet suburbs. But don’t confuse ‘regular’ with ‘dull’, for even at night it is clear that this house doesn’t hold back in terms of layout or style. Just see how delicately the exterior areas have been separated into garden features and stone-clad surfaces for walking and parking. In addition, the gable roof structure and the oblong volume on the right (which could be anything from a garage to an indoor swimming pool) are lit up majestically thanks to the warm glows of interior lighting. 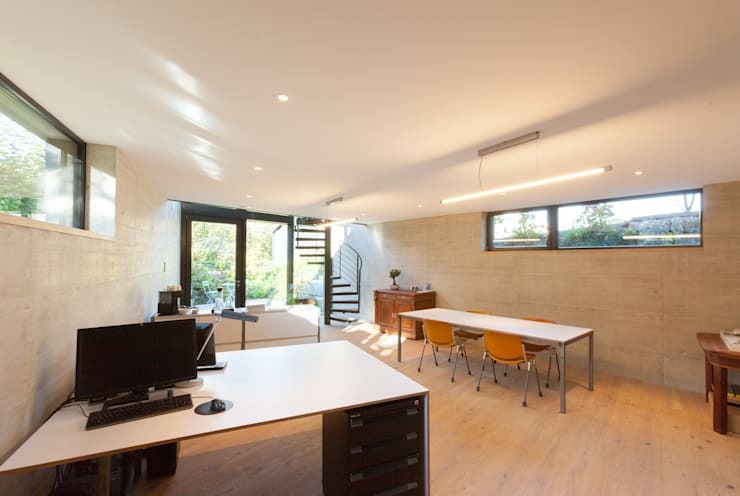 We’ll start our interior tour right at the bottom where, sunk into the ground beneath street level, the home office is located in a spacious layout. A modern and minimalist desk and table contrast nicely with some vintage pieces of furniture. The absence of overly embellished walls and decorations ensure a clean and visually quiet space perfect for working and concentrating – isn’t that what you want from your home office / study? Right next to the glass doors that welcome in a wealth of sunshine is located the spiral staircase, which leads to the floors above. Shall we have a look? Climbing the spiral staircase takes us to the loft area, which has been converted into a bedroom that receives one of the best views in this house – not to mention lots and lots of pleasant natural light. 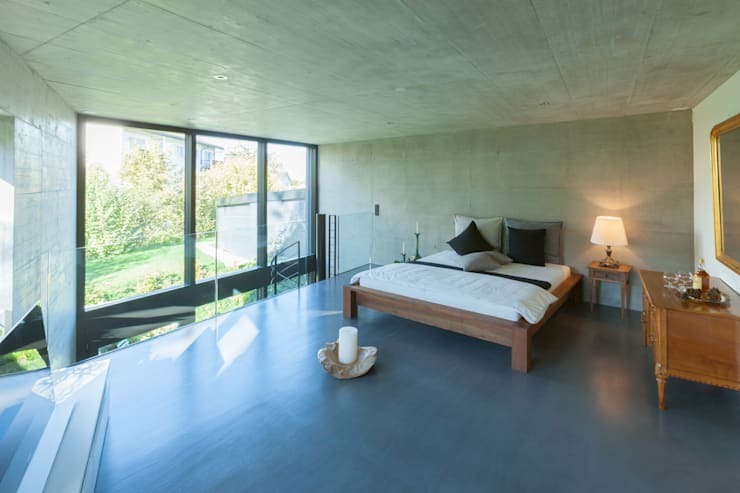 Similar to the study, the loft’s walls are left in a raw, slightly polished concrete look, yet here the tones take on a pale green hue to mimic the lushness of the garden outside. Contrasting strongly with this clean and quiet look are the furniture – bed, chest of drawers, side table, etc. – that all flaunt a rich and warm look thanks to the choice of timber used in their designs. We’ve reached one of the more private areas of the house which definitely gets a lot of attention – the rooftop terrace, where some R&R can be enjoyed while taking in the scenery and some fresh air. Some comfy outdoor seating and tables are safely fenced in thanks to the selection of potted plants, which add to the lush freshness of the space. Beautifully built and fashioned from blonde pine, the timber staircase serves as the transport system between the upstairs areas (bedrooms, bathrooms, and rooftop terrace) and the downstairs living areas (which will be revealed shortly). A crystal-clear pane of glass serves as a railing, yet also adds some contrast into the scene as it offsets beautifully with the raw timber and concrete. Want to style up your staircase with a little ‘something’? Then: Let’s Decorate That Staircase With A Garden. 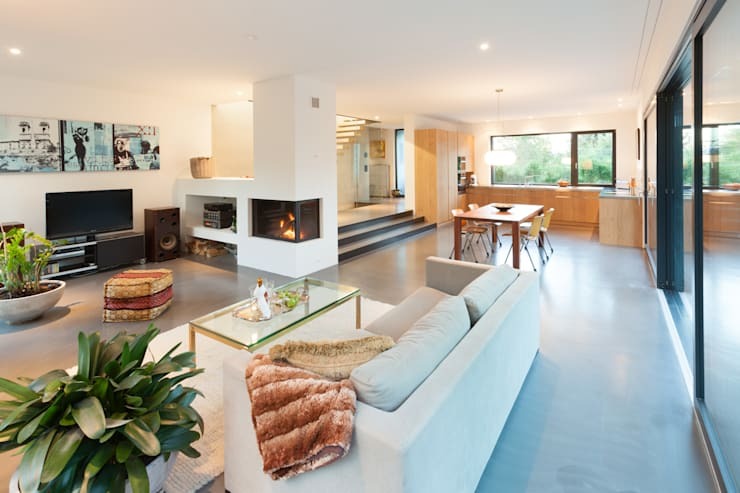 Here is where we relax and take a breather, for it is the living- and entertaining zone: an open-plan design which seamlessly combines the living room, dining room, and kitchen with each other. As this floor is entirely hidden from the street (thanks to it being sunk down from street level, yet on the same plane as the garden), it means the hangout zone is nice and private, while also being flooded with light. As in the rest of the house, neutrals take stylish control of the colour scheme, yet here we get some bits and pieces of cools and warms mixed into the palette (pear- and emerald greens, warm browns, earthy beiges, etc.). We conclude our tour with an exterior look at the house and how it stands in its pristinely maintained garden. The house is adorned with thin-slated weatherboards constructed from durable modern materials, lending it a look that beautifully resembles a modern mountain cabin. A stone-floored patio ensures some al fresco fun on the side, as well as beautiful views of the surrounding gardens. 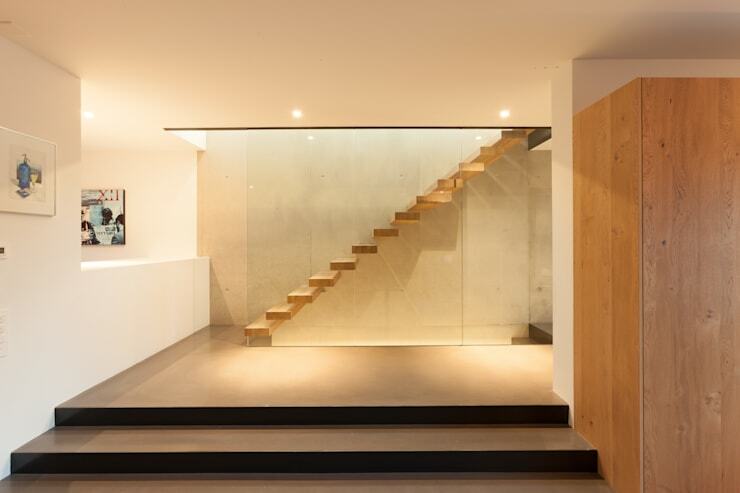 Most definitely one of the more interesting and surprising discoveries here on homify! 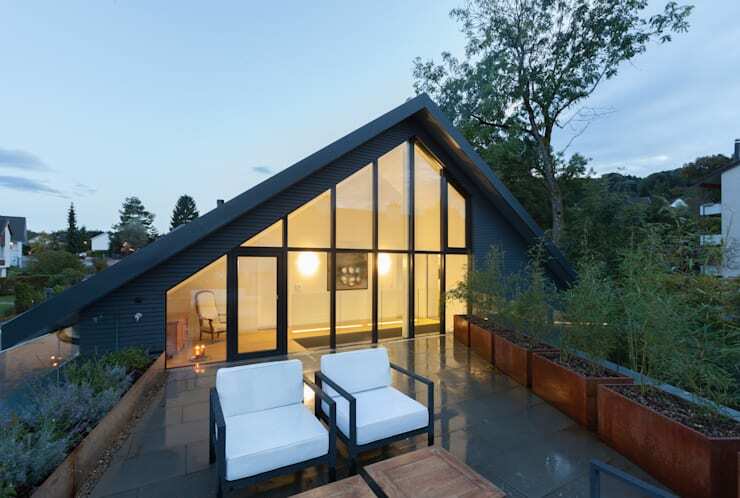 From landscape designers to expert tilers, we have them all here on homify, and much more. Check out our professionals page.